An artist's conception of the Feb. 15 flyby of asteroid 2012 DA14. This story was updated at 12:44 p.m. EST on Feb. 13. 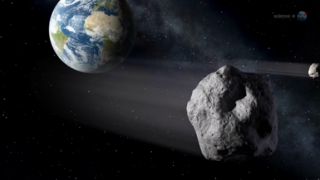 The space rock set to give Earth a historically close shave this Friday (Feb. 15) may be worth nearly $200 billion, prospective asteroid miners say. The 150-foot-wide (45 meters) asteroid 2012 DA14 — which will zoom within 17,200 miles (27,000 kilometers) of Earth on Friday, marking the closest approach by such a large space rock that astronomers have ever known about in advance — may harbor $65 billion of recoverable water and $130 billion in metals, say officials with celestial mining firm Deep Space Industries. That's just a guess, they stressed, since 2012 DA14's composition is not well known and its size is an estimate based on the asteroid's brightness. And not everyone thinks the guess is likely to be right. "Deep Space Industries is being far too optimistic about this particular rock," Michael Busch, of the National Radio Astronomy Observatory, told SPACE.com via email. "Nick Moskovitz at MIT has obtained an IR spectrum of DA14, and it is an L-class object," he added. "That means a stony composition, made of iron-magnesium-silicates, and minimal water and accessible metal content. It also is not obvious how much the value of water and metal in Earth orbit would decrease with an increased supply." "While this week's visitor isn't going the right way for us to harvest it, there will be others that are, and we want to be ready when they arrive," Deep Space chairman Rick Tumlinson said in a statement Tuesday (Feb. 12). This graphic shows 2012 DA14's path past Earth. Deep Space Industries wants to use asteroid resources to help humanity expand its footprint out into the solar system. The company plans to convert space rock water into rocket fuel, which would be used to top up the tanks of off-Earth satellites and spaceships cheaply and efficiently. Asteroidal metals such as iron and nickel, for their part, would form the basis of a space-based manufacturing industry that could build spaceships, human habitats and other structures off the planet. The idea is to dramatically reduce the amount of material that needs to be launched from Earth, since it currently costs at least $10 million to send 1 ton of material to high-Earth orbit, officials said. "Getting these supplies to serve communications satellites and coming crewed missions to Mars from in-space sources like asteroids is key if we are going to explore and settle space," Tumlinson said. Deep Space Industries is just one of two asteroid-mining firms that have revealed their existence and intentions in the past 10 months. The other is Planetary Resources, which has financial backing from billionaires such as Google execs Larry Page and Eric Schmidt. Deep Space aims to launch a phalanx of small, robotic prospecting probes called Fireflies in 2015. Sample-return missions to potential targets would occur shortly thereafter, with space mining operations possibly beginning around 2020. Planetary Resources also hopes its activities open the solar system up for further and more efficient exploration. The company may launch its first low-cost prospecting space telescopes within the next year or so.